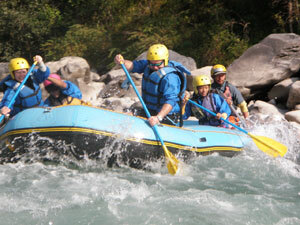 The Arun is respected as one of the most mighty and powerful rivers of Nepal. And large water volume, huge and impressive rapids, The rapids are challenge in terms of technically complex. The lower valley is in parts quite well populated with a wide variety of different tribes. The whole area is relatively unspoiled, and sees only a few trekking groups, mainly taking the Eastern approach to Everest and Makalu Base Camp. Fly to Tumlingtar or drive to Basantapur and Trek to Bumling Village take you three days trek, The River Distance 70 km put in point Bumling village to take out point Chatara takes you 5-6 days river action, The Powerful water volume and famous river: big rapids good scenery, unspoiled and remote village trek to put in point, It goes to the A part of Sunkoshi River where the rafting trips end. Best quality self-bailing inflatable raft, Whitewater safety helmet, modern plastic paddle, neoprene-wet suit, PFD-life jacket, Dry top Jacket, Waterproof Container/Barrel for camera and valuables things, Dry bag, First-Aid Kits and Tents/mass fly sheet and sleeping mat, other necessary camping gear cooking utensils, hygienically prepared food and drinks. High Mountain Wave Trekking team takes safety issues very seriously for every rafting trip and believe every happy outdoor trip is a safe one. Our team members have updated training courses - AR/CPR, Wildness First-Aid and Whitewater Rescue Technician conducted by Rescue 3 International. Besides in every trip also provides expert safety kayaker for rescue and make your rafting journey with us more comfort and enjoyable.